What is a ‘mid table finish’? Pre-season predictions often describe each of the 20 Premier League teams in one of the following terms: ‘title contenders’, ‘competing for Europe’, ‘mid-table team’ and ‘relegation candidates’. Three of the four are relatively tangible, and teams can eventually be assessed on whether they won the league, qualified for Europe or avoided relegation. A mid-table position is slightly harder to define. In theory, this should be anywhere between 9th and 12th in the table, but the reality is that teams in these positions needn’t necessarily have been safe from relegation, nor out of the running for Europe. For example, last season Norwich finished 11th despite being 16th and 3 points off 18th with two games to go. 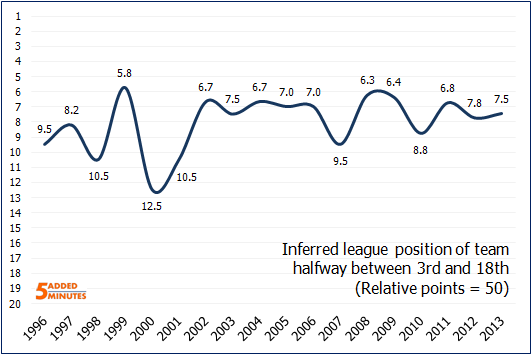 For the purposes of this post, I’ve created a ‘relative points’ score; illustrated in the context of last season below. It essentially calculates the relative position of teams between 18th and 3rd based on a team’s final points total. By stripping away runaway teams at the top and struggling teams at the very bottom, we get a sense of where the true ‘mid table’ teams lie. In 2012-13, no such team existed; West Ham in 10th were only 26% of the way up to 3rd from 18th. 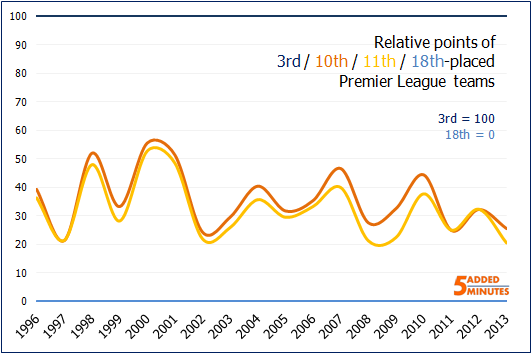 There has been no obvious trend during the Premier League era, though certainly in the last few seasons the points totals of supposed mid table teams has been much closer to the last relegation spot than 3rd place. We can also infer where a mid-table team would be each season, by calculating the league position of a team halfway between 3rd and 18th. Last season, this was a team theoretically between Liverpool and West Brom, in ‘7.5th’ place. Bizarrely enough, the ‘effective’ mid-table team in most seasons would in fact be competing for one of the last European places. The ‘relative points’ metric only gives a sense of where mid-table truly exists; using 3rd and 18th as the top and bottom places is debatable. Nevertheless, it reinforces the point that pre-season predictions should focus primarily on points totals rather than league positions, as often league positions belie the true standing of a team.